“In a pleasant valley near Coxwold, in the Wolds of Yorkshire, stands the ruined but still beautiful Abbey of Byland. The style of the remains is peculiar, but extremely light and graceful. These consist of the west front, and one end of the transept. Every part of these remains bears testimony to erection at different periods. The central door has a richly cuspated arch, with several receding pillars and mouldings. Above it is a row of light lancet arches, with a line of similar semi-arches running above them. Higher still is the lower half of a noble circular window. On one side of this main structure remain a heavy round-headed doorway, and a round-headed window above it, both consisting of several pillars and mouldings, evidently of the oldest date in the building. On the left hand is a richly-wrought lancet-headed doorway, and this is all that now remains: sufficient, however, to denote that the monastery, when perfect, was extremely elegant. The date assigned to its first erection accords with the older, round-arched portion, being of the period when the remains of Saxon had not yet disappeared from Norman buildings. 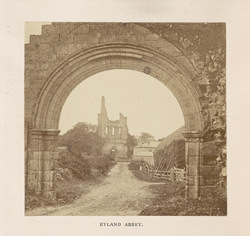 Excerpt from “Byland Abbey”, in ‘Ruined Abbeys and Castles of Great Britain and Ireland’ by William Howitt.